I have developed a lasting interest in the Chernobyl disaster since discovering Elena’s photojournal. I discovered some photos taken in 1995 by GreenPeace. You should check them out and you will see that there was still some activity within the dead zone at that time. UPDATE: Now you can tour Chernobyl and write your own story. Here are two photos of the same entrance taken 9 years apart. The second photo was taken by Elena. The building near the gate is the residence of the town guard. Chernobyl fascinates me both as a cautionary tale of technology used carelessly, and as a study in human nature. There is such a common tendency to cover up mistakes and minimize bad news, that it is hard to find out how much damage was done to the environment and the people of the region. I found many different reports on the disaster by using Vivisimo, but I am not going to link to them here because they offer so much contradictory data. I even had a visitor complain about my earliest Chernobyl post. She felt that Elena was not giving a true perspective of what happened. When I attempted to verify what happened at the moment the reactor blew, I found several stories and none corroborated the others. Until I know better, I’ll stick with Elena’s version. She does not seem to have any axes to grind or stories to hide. that the world is destructible and man is a great contributor to that destruction. My husband had sent me the url because it was going around via e-mail where he worked. The great thing is that it seems to have hit the weblogs big time in the last few days, and more and more people will be made aware of this tragedy. I’m pointing people to your weblog as well since you may have more stuff on it going back a ways. Thanks! I have found myself trying to see just what happened so long ago. I am looking for pictures of the event the day it happened, there must be pictures of the plant, the fire, the rescue and so forth, I wanted to see what the people saw that day and the few following. Any ideas as to where I might find these pictures? I realize that the people that took them, are most likely not around any longer. there were pictures of the workers who were cleaning up the disaster. You can also Google for: Chernobyl, pictures. My teacher (envioromental studdys) said we had to look this up and i was shocked! i didnt even know this had happened and seeing the effects in the photos on this site it makes me feel soo lucky that i am alive and that i shouldnt take lif for granted. Even though Chernobyl happened soo long ago and for some of us soo far away we must never think that it wont hapen again all it neads is a test on the reactor and the people to forget safty procedure and the same thing could happen maybe with less results maybe with more but i pray it doesnt the world is fine as it is, who needs nuclear power? how did the misshap happen? do u have any pictures of the explosion? how many people suffered from this accident? 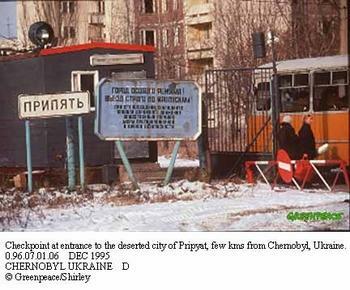 What happened at Chernobyl is carelessness at it’s worst! 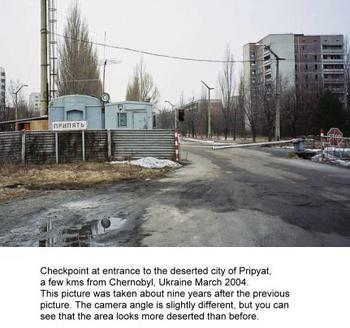 !Now the land is useless and harmful to human life, and should not be lived in for hundrededs of years to come.I want to know if anyone was held responsible for this disaster?And how come most people dont know about Chernobyl?Im facinated and shocked at the same time!! !